I've counted them. I've added them all by name. There's exactly 31. Among them are nursery workers, children's ministry coordinators, Sunday School and Wednesday night teachers, and small group leaders. Their talents are many. Their hours of service to my children are numerous. Their willingness to be poured out in sacrificial service for God each and every week...unmeasurable. Every year, our family gathers around the dining room table in assembly-line fashion to put together small gifts of thanks to all the children's ministry volunteers who invest in our family each week. This year, we put together small gift bags filled with all-natural Christmas potpourri that when simmered on the stove, make an entire house smell like warm, spiced cider. This potpourri is easy to assemble and makes for a welcome alternative to the traditional Christmas cookie or jar mix "thank you" gift. Fill one cellophane bag with the ingredients listed. Secure with a twist tie. Use raffia twine to attach a copy of the "instructions" to the bag. Place all items in a saucepan and cover with water. The potpourri can be re-used several times as long as additional water is added to the saucepan each time. 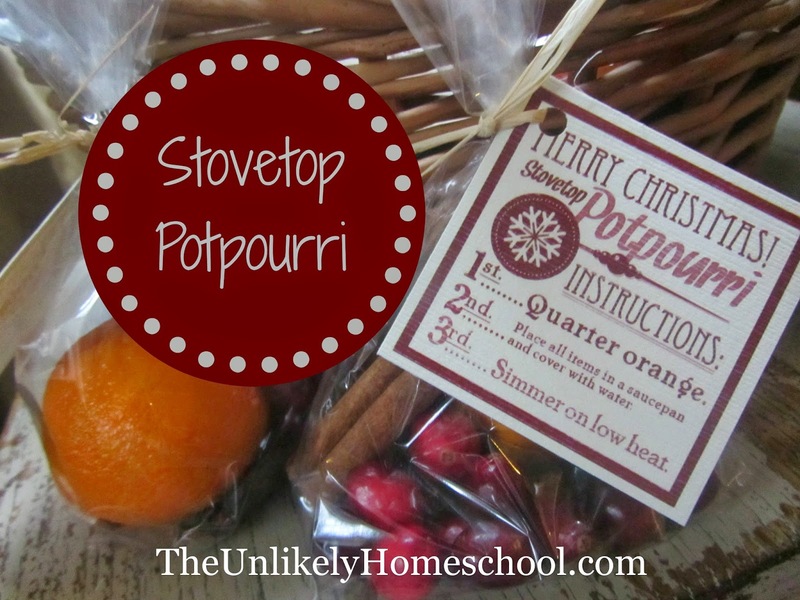 Don't forget to download your copy of the Stovetop Potpourri Instruction tags. *These printables are FREE but are for personal use only. In downloading the following files, you are agreeing not to copy, reproduce, or alter them except for your own personal, non-commercial usage. In addition, you are also agreeing not to share or publicly display any or all parts of the materials on Facebook, in an email, or in person. If you wish to share the downloads with others, please share a direct LINK to this post. Those were exactly our thoughts...potpourri would be something different than sweets...which is something most people have way too much of this time of year. Plus it smells soooooo good on the stove! Just wanted to thank you for this post! We have a lot of people to give Christmas gifts to at church (Sunday School teachers, choir director, AWANA leaders, etc) for our five kiddos. This was an awesome idea, since there are a lot of food allergies to avoid in giving gifts! I just made some to deliver to the kids' teachers at our Bible study tomorrow! Merry Christmas!! Yes, we have that same issue at our church...lots of food allergies. So, these were perfect.